My Ancestors are from Britain-- What do I do next? A note to my wonderful readers: Fab Finds will be on hiatus for the next two weeks due to RootsTech 2016. Fab Finds will return on February 19, 2016. Thank you! The RootsTech 2016 class syllabi and streaming schedule are now available at RootsTech.org. I noticed that they have changed the tabs across the top of the website too. 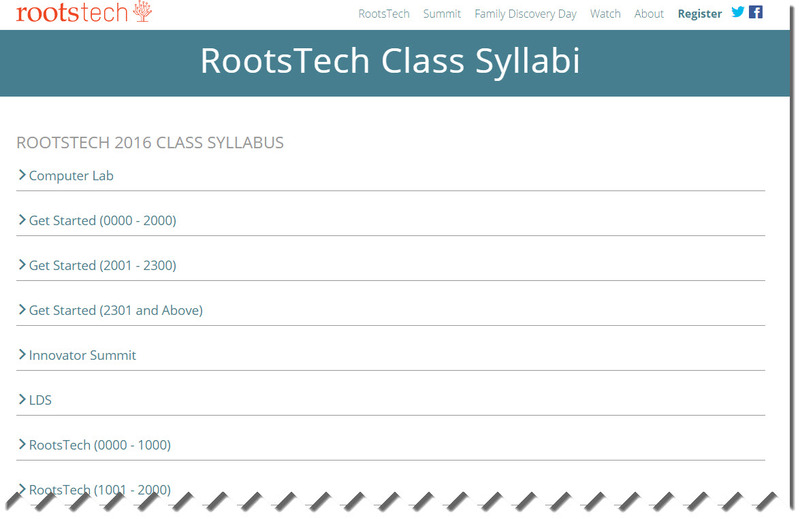 Here's how to access the class syllabi. 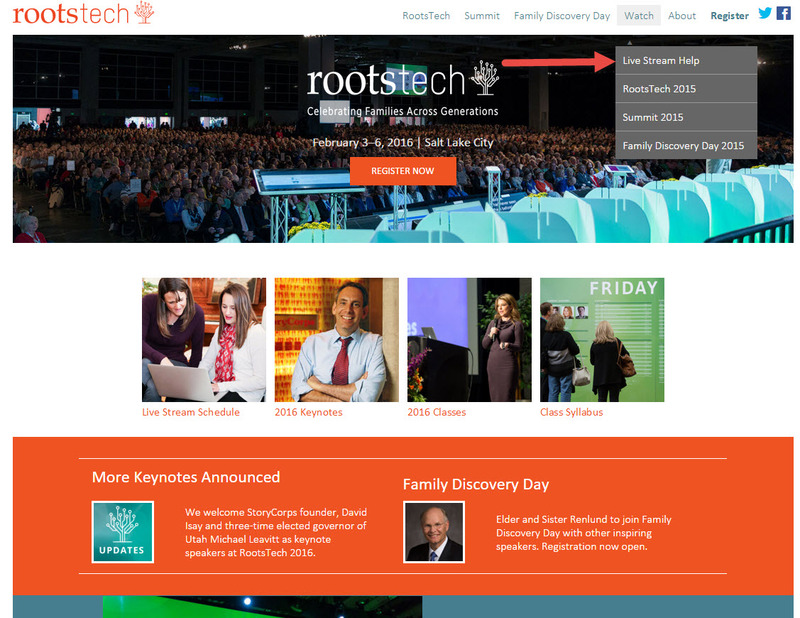 Go to RootsTech.org. Click on the RootsTech tab, then click on Class Syllabus. That's all there is to it. 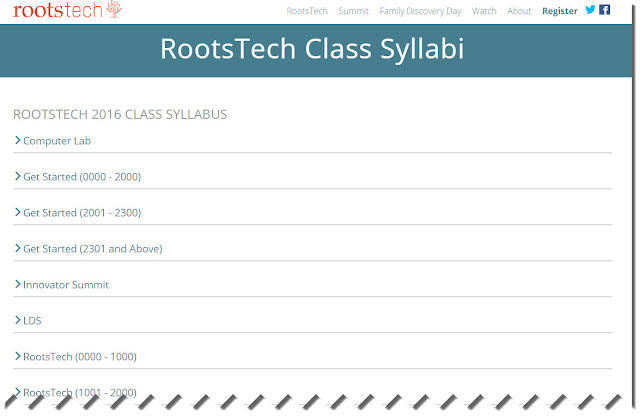 You will then see the syllabi listing as shown in the screenshot below. I've also provided you with a link to the syllabi below. To access the streaming schedule, click on the Watch tab at the top of the RootsTech.org website. Then click on Live Stream Help. You will then be taken to the streaming schedule. Here's the direct link for the streaming schedule. 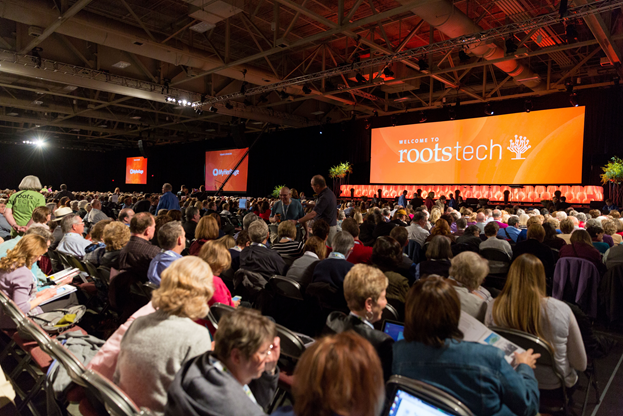 It's not too late to register and attend RootsTech 2016 in person. 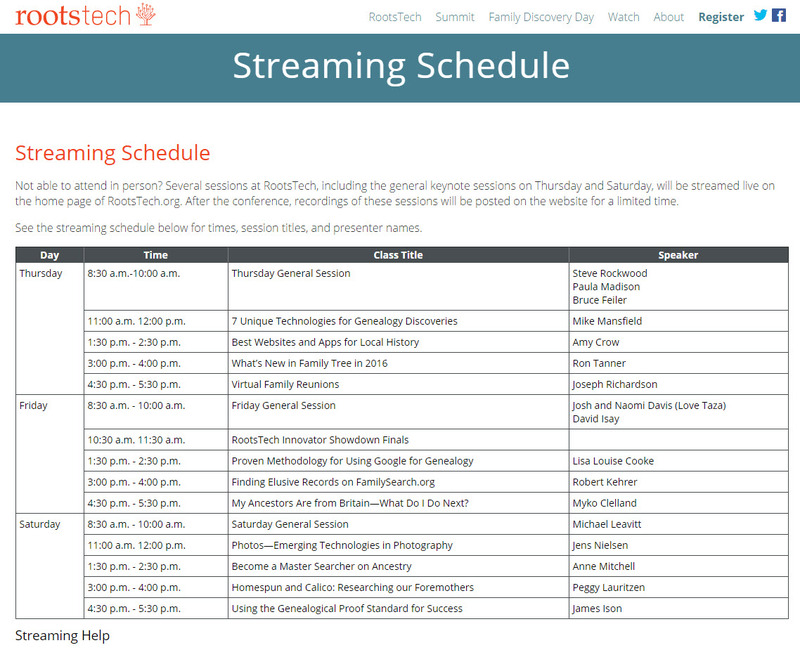 But, if you can't attend, it's wonderful to have the general keynote sessions and classes available to watch at home. 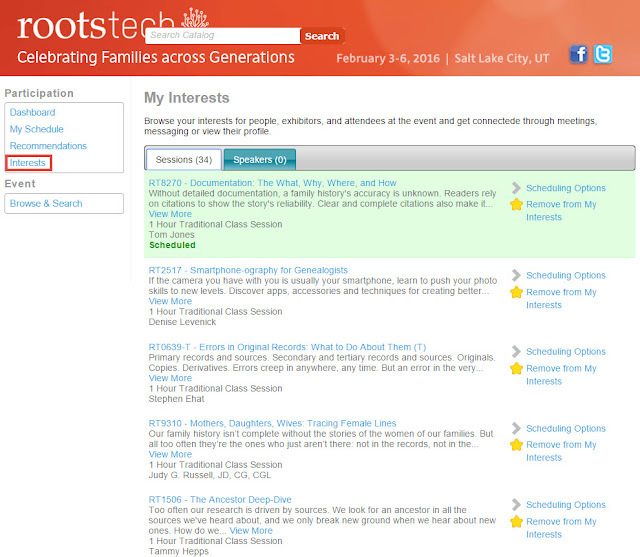 SALT LAKE CITY, 28 January 2016—RootsTech, the largest family history conference in the world, announced today the complete lineup of speakers for its free Family Discovery Day event, which will take place Saturday, February 6, 2016, at the Salt Palace Convention Center in Salt Lake City, Utah. This incredible opportunity is specially designed for families and members of The Church of Jesus Christ of Latter-day Saints ages 8 and older. 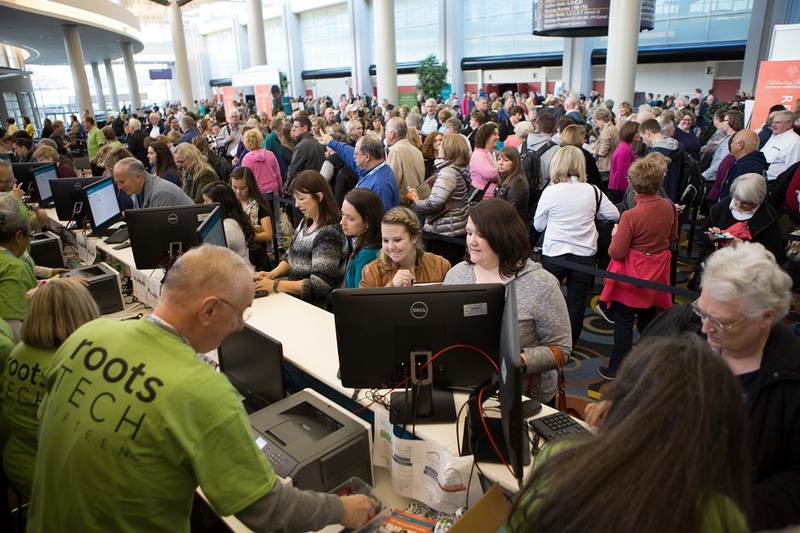 The free one-day event will feature inspirational messages, instructional classes, interactive activities, and exciting entertainment designed to teach LDS families how to find their ancestors, prepare names for temple ordinances, and teach others to do the same. Attendees will also receive access to the Expo Hall, where hundreds of exhibitors will showcase the latest technology and tools. The Church of Jesus Christ of Latter-day Saints and FamilySearch will host the event. 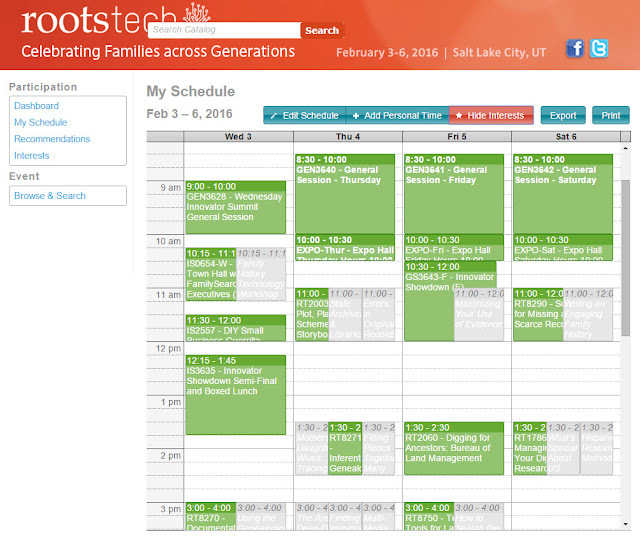 Families are encouraged to register online at RootsTech.org. 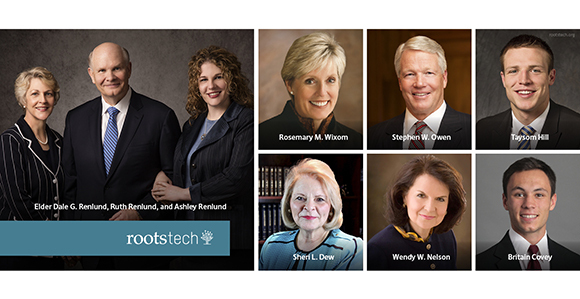 This year’s event will kick off with an exciting opening family general session featuring newly called apostle Elder Dale G. Renlund and his wife, Sister Ruth Renlund. Their daughter, Ashley Renlund, will join them for what will be an inspiring and candid moment with the entire Renlund family. This 45-minute opening session starts at 1 p.m.
Sheri Dew and Sister Wendy Watson Nelson will speak during the family history discussion, which will be an exclusive conversation between best friends. Sheri Dew is the executive vice president of Deseret Management Corporation and the CEO of Deseret Book Company. Sister Wendy Watson Nelson is the wife of President Russell M. Nelson and was a professor of Marriage and Family Therapy. They will share their life experiences with family history during this 45-minute session, which starts at 2 p.m.
Primary General President Sister Rosemary M. Wixom and Young Men General President Brother Stephen W. Owen will speak during the family session. Sister Wixom will share how the plan of salvation and family history provide a taproot that anchors our children. Brother Owen will speak about the role of families in the plan of salvation. This uplifting 30-minute session starts at 3:15 p.m.
Family Discovery Day continues its amazing lineup with a session featuring Britain Covey and Taysom Hill. Britain Covey is a University of Utah Wide Receiver from Provo, Utah. Taysom Hill is a Brigham Young University Quarterback from Pocatello, Idaho. They will both share inspiring stories, humorous memories, and faith-promoting experiences. This 30-minute session will start at 4:15 p.m.
Family Discovery Day will close with a stunning performance by The Lower Lights, a gospel and folk band that recently performed at Kingsbury Hall. The band will bring its part-revival, part-vigil sound steeped in tradition to Family Discovery Day for an exclusive performance that attendees will not want to miss. The performance starts at 5:30 p.m.
Family Discovery Day is free, but registration is required. Visit RootsTech.org to learn more and to register. I recently received a fun email from FamilySearch. Here's a screenshot showing part of it. 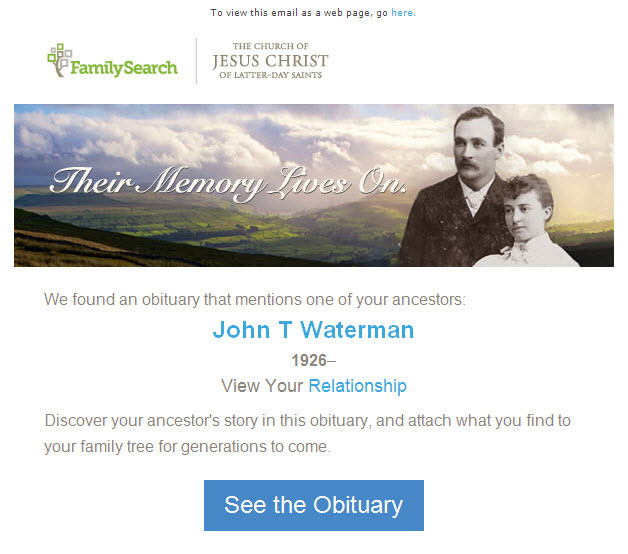 The email said that they had found an obituary for one of my ancestors named John T. Waterman. I clicked on the "See the Obituary" link and was brought to the page in the screenshot below. I clicked on the "Sign In" tab and a list of ancestors showed up that included John T. Waterman. 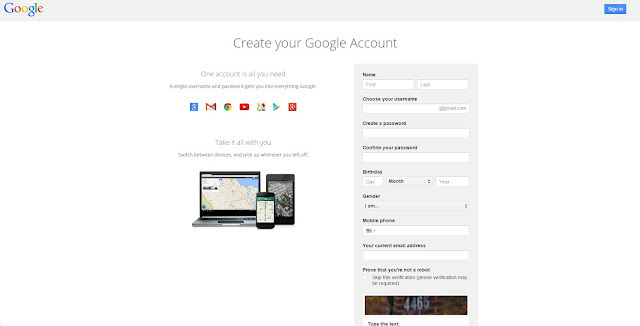 This is a screenshot showing part of the list. How fun is this?! Thank you FamilySearch! 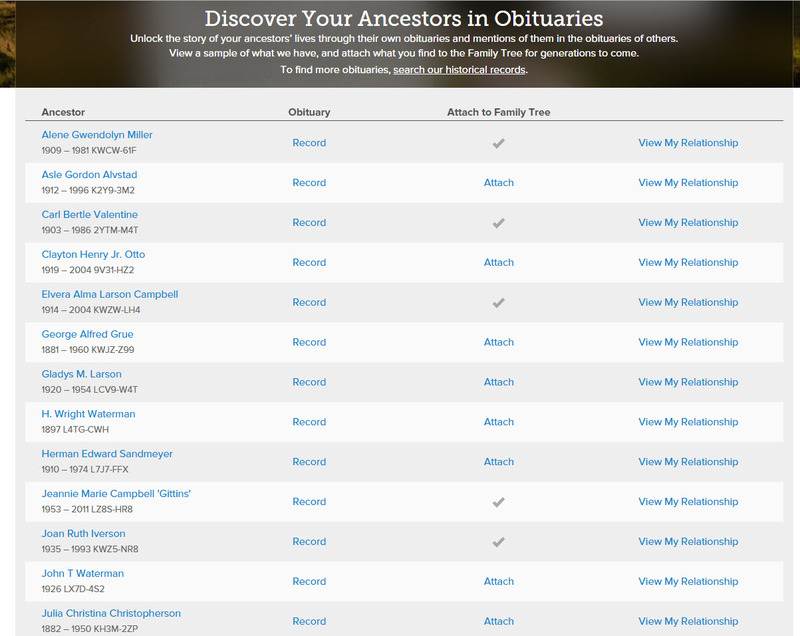 These obituaries may not be for the ancestors in the list, but these ancestors may be mentioned in the obituaries. Obituaries are wonderful resources that can contain helpful information and clues for finding additional ancestors. 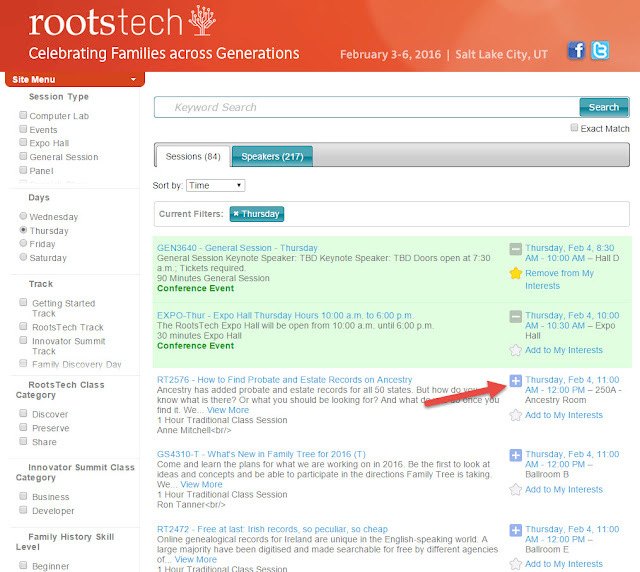 Have you received a similar email from FamilySearch? 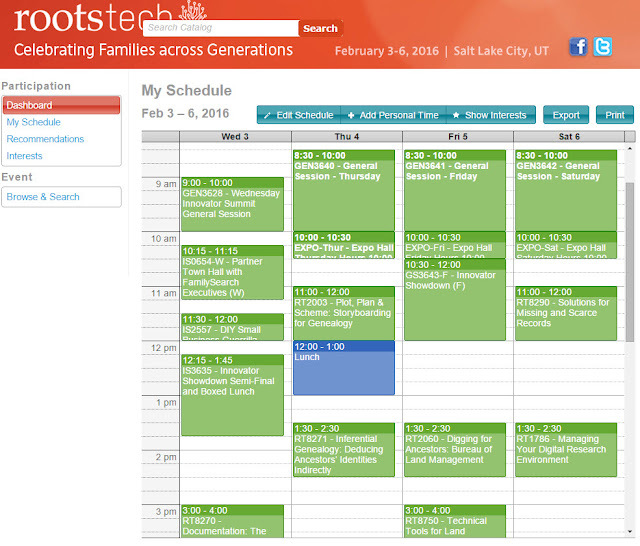 SALT LAKE CITY, 27 January 2016—RootsTech, the largest family history conference in the world, is looking forward to over 20,000 visitors over four days with an exciting array of speakers and entertainers, over 250 interesting and informative classes, a huge expo hall with more than 160 exhibitors. 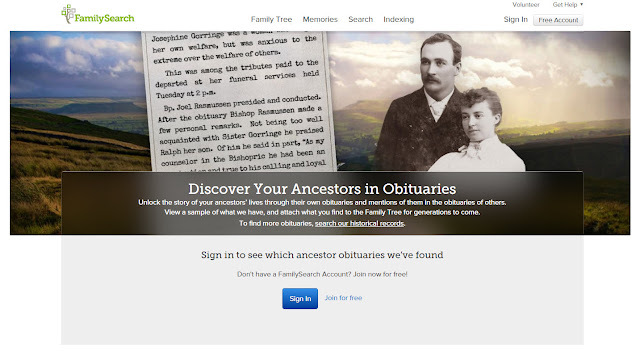 There is something for every level of family history—from the beginner to experienced. The three-day conference begins on Thursday, February 4, and goes through Saturday, February 6. 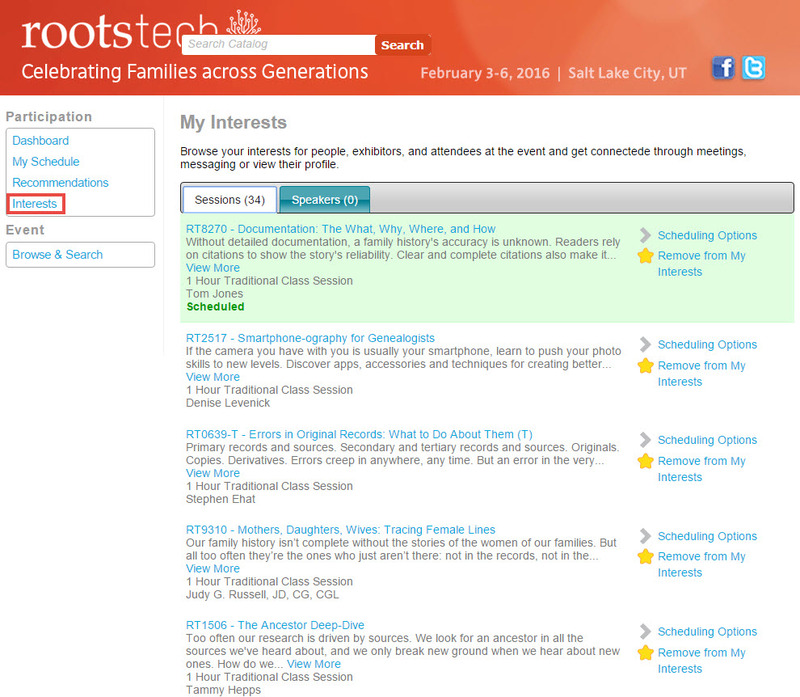 For more information go to RootsTech.org. The keynote speakers and offerings reflect the growing influence of family history. Today multiple generations of all ages are engaging through family storytelling and sharing memories within families using social media and an expanding array of new technologies and mobile apps. The opening session on February 4 will begin with Stephen T. Rockwood, who is the managing director for the Family History Department of The Church of Jesus Christ of Latter-day Saints and President/CEO of FamilySearch International. Also featured is Paula Williams Madison who is chairman and CEO of Madison Media Management LLC, a Los Angeles based media consultancy company with global reach. 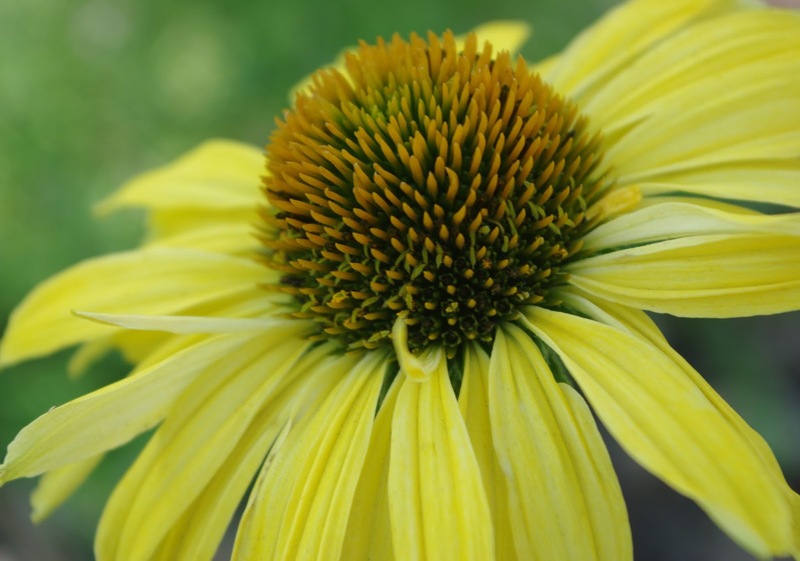 After her retirement in 2011, Madison started doing research on her family lineage. She wrote the book and produced a movie Finding Samuel Lowe: China, Jamaica, Harlem in April 2015 about her experiences. A free screening of the movie will be provided on Wednesday, February 3. Bruce Feiler is one of America’s most popular commentators about contemporary life. He hosts the PBS series Walking the Bible and Sacred Journeys with Bruce Feiler. He wrote The Secrets of Happy Families containing best practices for busy parents from some of the country’s most creative minds. He has appeared on many television shows on NRP, CNN, Fox News, MSNBC, and others. On Friday, February 5, David Isay, is a scheduled keynote. He’s the founder of StoryCorps, an award-winning organization that provides people of all backgrounds and beliefs with the opportunity to record, share, and preserve their life stories. 50,000 interviews have been archived and preserved at the American Folklife Center at the Library of Congress. He has also written several New York Times bestsellers, including Listening is an Act of Love. He is a broadcaster and documentarian, and his research reveals ways to tell great stories for the family historian. Also on Friday, Josh and Naomi Davis, popular family bloggers known as Love Taza, will speak. On their blog, they relate their life with their three children in bustling New York City. The blog has become a digital destination viewed by millions around the world. People love the inspiration about raising a family and the appreciation Naomi has for life’s simple joys. 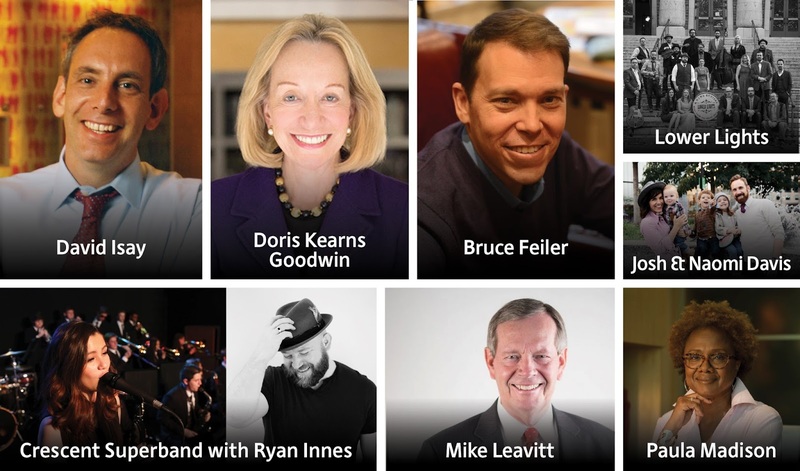 On Saturday, February 6, Doris Kearns Goodwin is a world-renowned presidential historian and Pulitzer Prize-winning author. She worked with Spielberg on the movie Lincoln, based in part on her award winning Team of Rivals: The Political Genius of Abraham Lincoln. She has written books about Frank and Eleanor Roosevelt, Lyndon Johnson, and the Kennedys and shares her expertise and commentary on many television shows. She has a PhD in government from Harvard and was an assistant to Lyndon Johnson and has been a consultant in several PBS and History Channel documentaries. Also on Saturday, Michael Leavitt, a three-term former governor of Utah, will speak. He also served in George W. Bush’s cabinet as an Administrator of the Environmental Protection Agency and Secretary of Health and Human Services. The second annual Innovator Summit is a one-day event on Wednesday, February 3, for developers, entrepreneurs, and innovators from around the globe to explore, examine, and discover business and technological opportunities within the family history industry—a rapidly growing multibillion dollar industry. Innovators from around the globe and from all industries will be competing for a piece of the $100,000 in total cash and in-kind prizes. The keynote speaker for this event will be Ken Krogue, an entrepreneur who has taken his business InsideSales.com from a small beginning to a billion dollar industry. He will share his expertise about social media and how to use the different forms effectively. Along with the keynotes, RootsTech attendees will be able to hear from the Crescent Super Band, featuring Ryan Inness, and Lower Lights, a popular gospel and folk band. 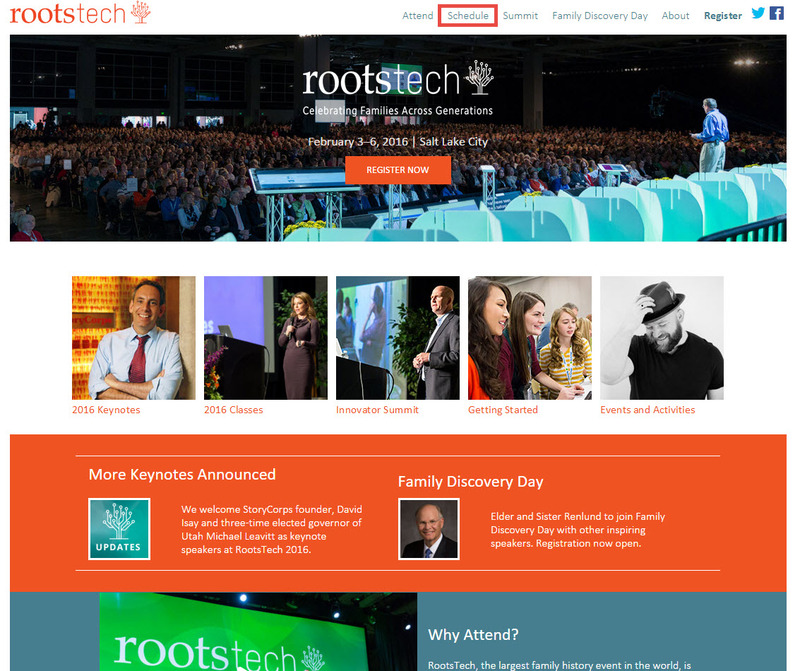 More information about speakers, entertainers, classes, and how to register at RootsTech can be found at RootsTech.org. 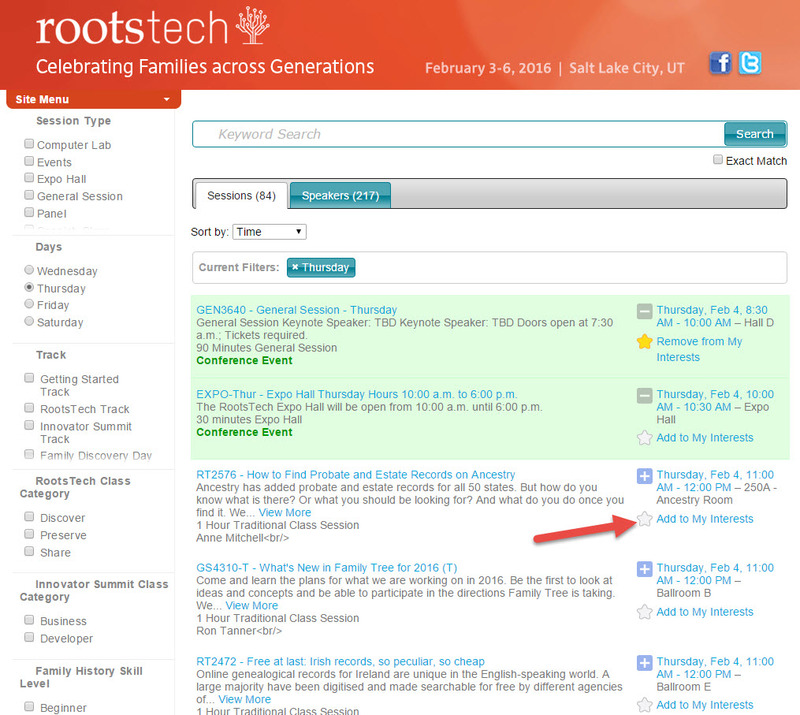 The genealogy community is a friendly and rather social bunch. They share knowledge, information, documents, research triumphs and struggles, joys, sorrows – even pictures of cats. So why not selfies? Chances are good that if you’re on Facebook or Twitter, you have a hefty number of “genealogy” friends – many that you probably have never met in person, but regularly interact with through Likes, Shares, and Comments on one another’s posts. 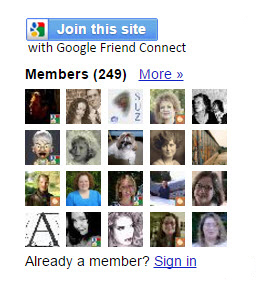 Peruse your list of “genealogy’ friends and you’ll most likely find that many use a photo of an ancestor, or a baby picture, as their profile pic. It adds quite the variety to your friends list, but you wouldn’t know them if you ran into them in the vendor hall at a conference, or sat next to them at a workshop. 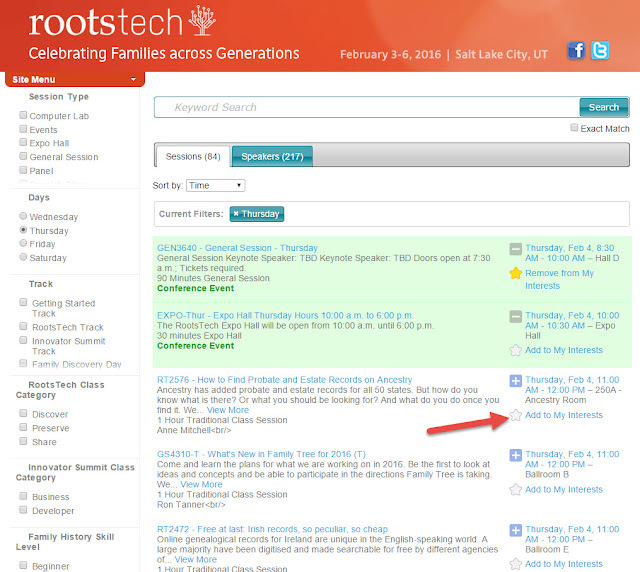 And with RootsTech just around the corner, there’s an opportunity to possibly run into thousands of them in person! ConferenceKeeper and Geneabloggers are delighted to offer a solution. They are officially proclaiming February 1st as #GenealogySelfie Day – a day for social folks who love genealogy to snap a picture of themselves and share it on Facebook and/or Twitter with the hashtag #GenealogySelfie. It will be fun to put faces to names, and increase the chances of recognizing one another at RootsTech and other upcoming events and conferences. Join in the fun for the first ever #GenealogySelfie Day on February 1. 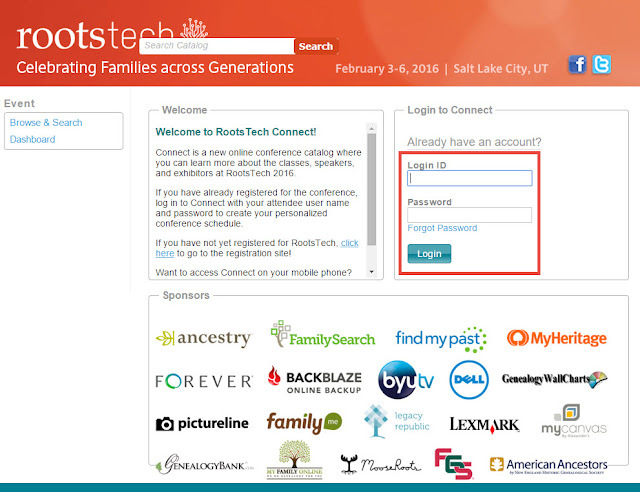 Today I learned about some amazing numbers regarding registration for RootsTech 2016 and RootsTech's free Family Discovery Day. So far, 20,000 people have registered to attend RootsTech's Family Discovery Day! And close to 10,000 people have registered to attend RootsTech 2016. Wow! That's fantastic! There's still time to register if you haven't already. Just head on over to RootsTech.org to register. 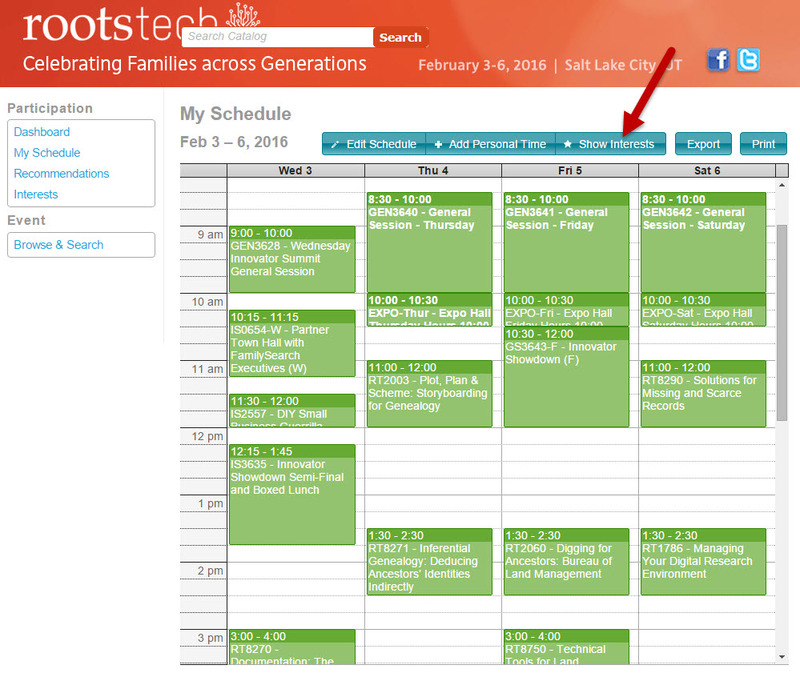 If you are unable to attend RootsTech 2016, live streamed sessions will be broadcast at RootsTech.org. The live streaming schedule should be available sometime this week. 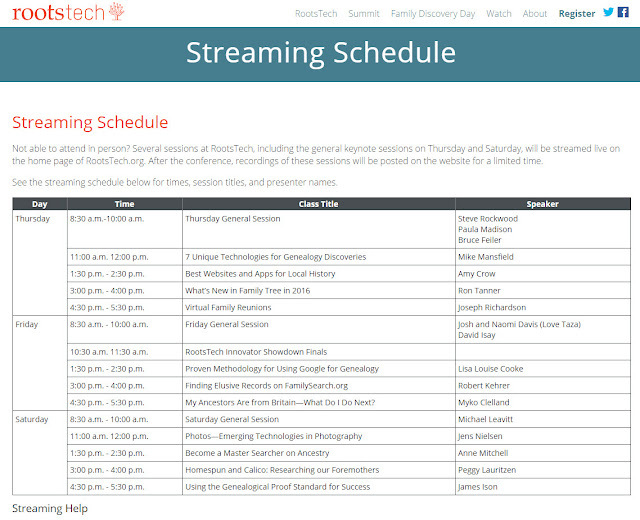 The Family Discovery Day live streaming schedule has already been released. 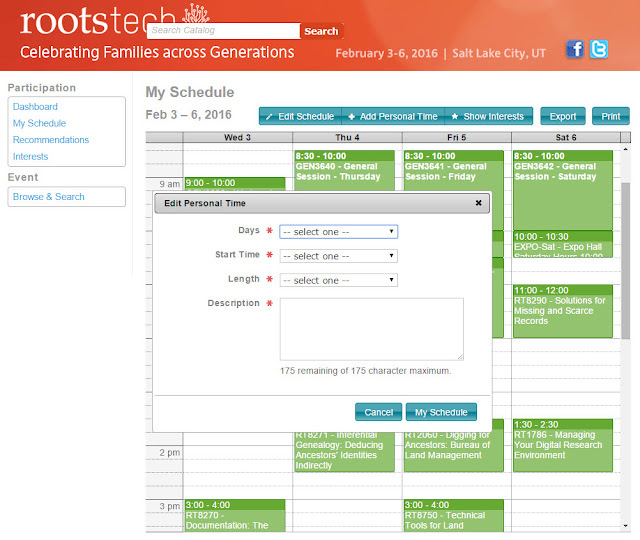 To see that schedule, click HERE. 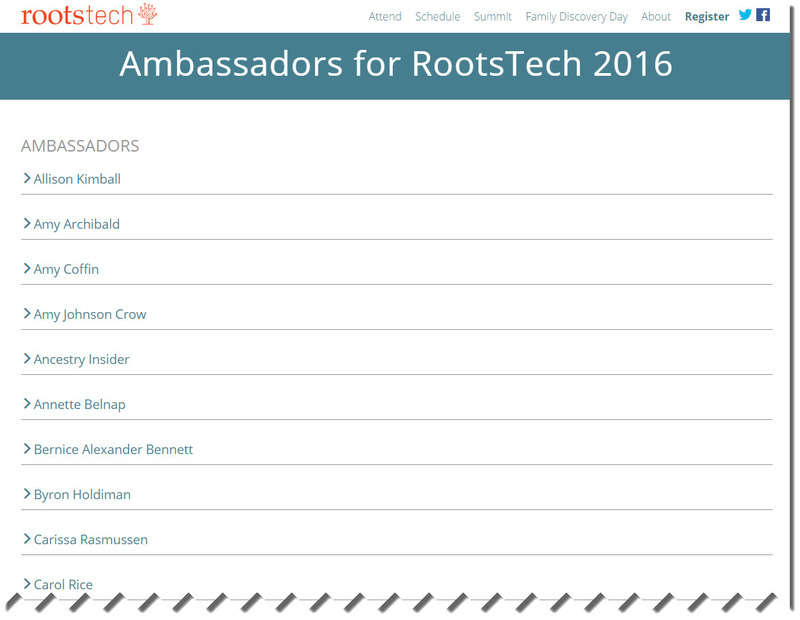 Recently my Ambassador bio was added to the RootsTech 2016 Ambassador list on the RootsTech website. Yay! I thought I'd share it here on my blog. Jana is a wife, mom, grandma, genealogist and family historian. She loves family history and enjoys learning about her ancestors. She has been sharing her family history on her blog, Jana's Genealogy and Family History Blog, since April 2012. In addition to her genealogy blog, Jana is the author of a vintage postcard blog, her personal blog, and a website: Grandpa's Postcards, Jana's Place and Jana's Genealogy and Social Media Hub. 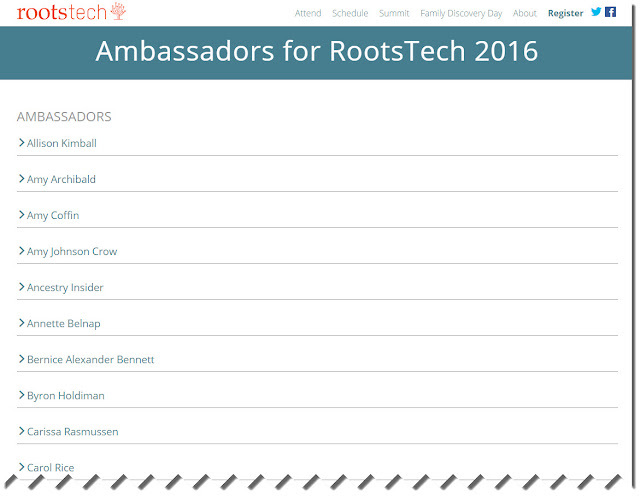 There are many other RootsTech 2016 Ambassadors who are and will be sharing information about RootsTech 2016. 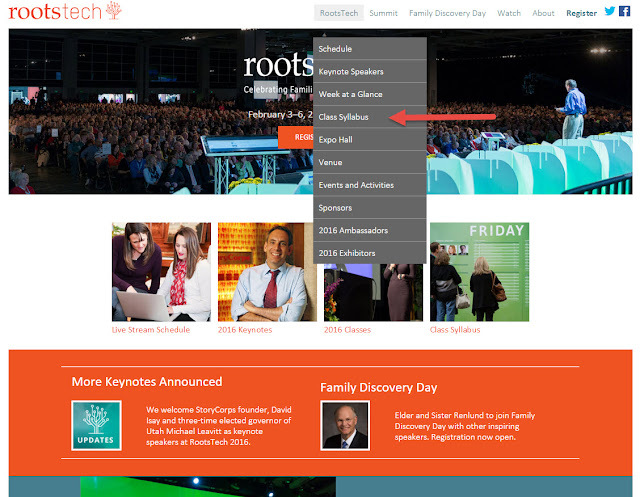 Here's a screenshot from the RootsTech website that shows a partial list of the Ambassadors. To see the full list of RootsTech 2016 Ambassadors, click HERE. 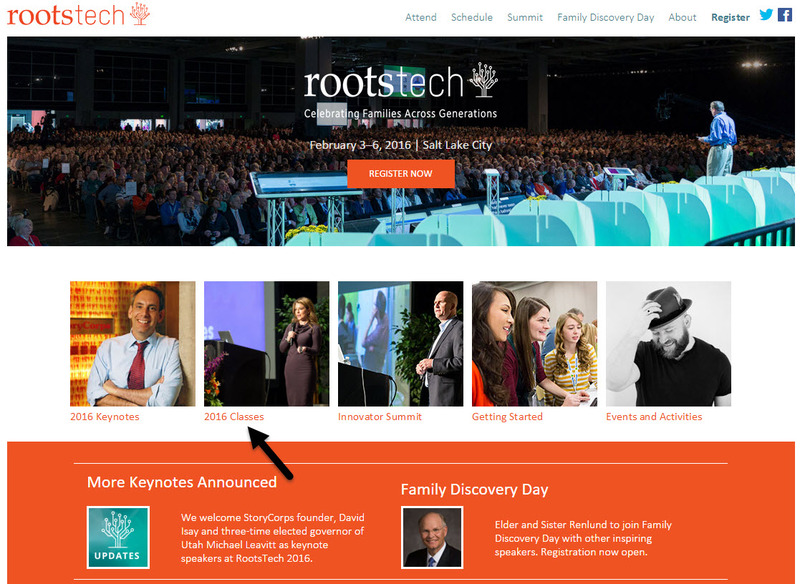 If you'd like to follow along with the happenings at RootsTech next month, please check out and follow my fellow Ambassadors' blogs and other social media sites by going to the Ambassador list. 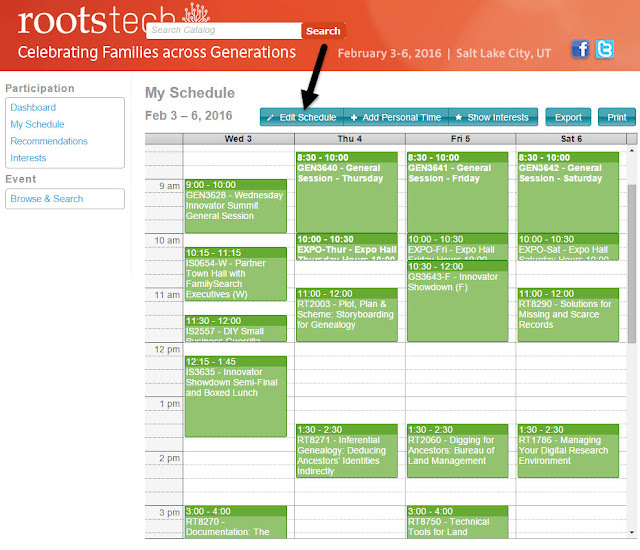 I'm so excited about attending RootsTech! I leave for Salt Lake City in two weeks!